Well, it’s official, I’m one year older. Not that it’s a big deal or anything, but whoa does time fly. My lovely and awesome wife decided to have a few things up her sleeve this past weekend to make me feel extra special, and it was just fun and relaxing. Our original plans got cancelled due to my laziness and well, crappy Wisconsin weather, so instead of going downtown and dining at La Merenda, we decided to stay local and try out a chain restaurant (yes, I said chain) called Flemming’s Prime Steakhouse and Wine Bar. I would have been happy ordering a pizza, but she wanted to do something special, and I’m glad she nudged me out of my laziness. I won’t go into details, but Flemming’s was pretty awesome. I ordered some steak, due to the restaurant being a steakhouse and all, as well as some onion rings. The onion rings were huge, and we were forced to bring them home as we definitely could not finish them. As I stared at the take home box one morning, I decided I would use them in a way that I never thought of using them, and eating them for breakfast. As I have done some fun things with eggs being a center piece in the past, I figured I could do no wrong with utilizing a leftover onion ring for breakfast, and boy was I ever right. If you are using a leftover onion ring, place it onto a baking sheet into a preheated 350 degree oven for about 7 minutes to re-crisp the onion ring. When the onion ring is nice and crispy, remove it from the oven, and set it aside. Heat a non-stick skillet on medium heat. Add the oil, and the butter, and give that a nice swirl. Once the oil and butter are heated through, add the onion ring to the center of the skillet. 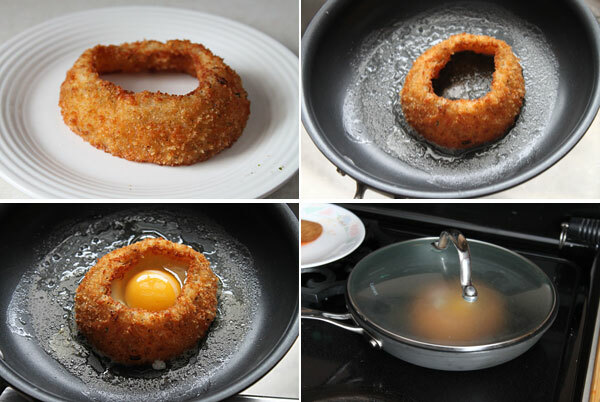 Crack the egg, and carefully pour the egg inside of the onion ring. Cook the egg for about four minutes, then cover, and remove from the heat. Cook an additional 2 minutes or so, until the egg white has stiffened. Uncover and season with salt and pepper. Slide the egg onto your serving plate, and slice into it. The end result was nothing short of amazing. In fact, as I sliced through the first bite, I kind of giggled about how awesome this thing was. 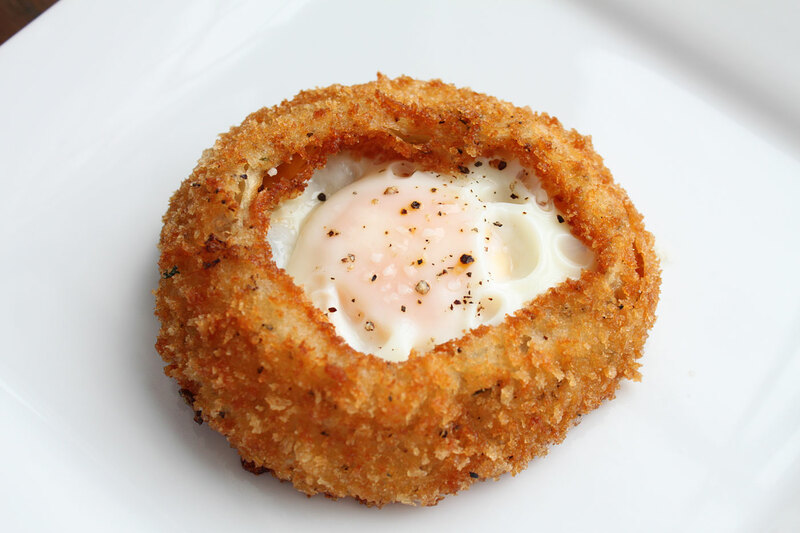 It has the great texture from the crunch of the exterior of the onion ring, a sweetness from the onion, and the perfect dressing from the yolk. I impressed myself to say the least. Okay, why I never thought of this before myself. This is fabulous. I’m gonna do this ASAP. And a very Happy Birthday and may you have many more! Happy birthday! As of yesterday, I’m another year older as well. I have a pinterest board devoted to eggs and I’m pretty sure this is the best damn egg post I’ve ever seen!! Love at first site ! This not only sounds good but looks good also. I am going to have to get some onion rings and try this. Thank you for sharing this great idea. what an unbelievable idea…I’ll tell my husband I though of it…. Hi Clarice, cook the frozen onion rings first, then drop in the egg, and go from there. 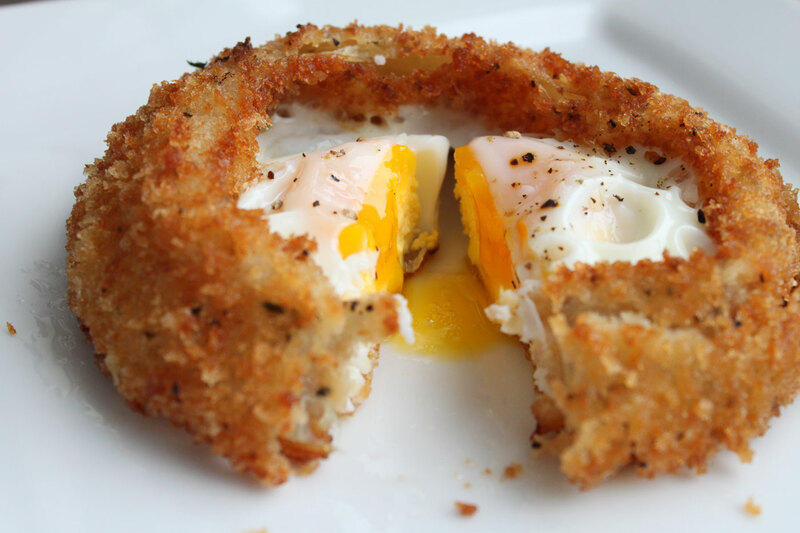 You can go about 75% cook on the onion ring if you want prior to the egg. Enjoy! Great idea! Feel free to make it your own as well as part of brunch, a side, or however you like. Happy Valentines!